Prepare yourself for a thrilling and adrenaline-filled fun day with some of the most exciting experiences and rides at Warner Bros. World and Yas Waterworld, Abu Dhabi. Enjoy a visit to two of the best theme parks in the Middle East for the price of one, with this combo pass. Rides ranging from mild to extreme across both the parks are sure to get everyone’s hearts racing. Your tour of Warner Bros. World Abu Dhabi will begin at the Warner Bros. Plaza, which is at the epicenter of the theme park and pays homage to the Golden Age of Hollywood with its classic art deco design. The theme park has six immersive lands that have been designed keeping in mind iconic Warner Bros. characters and worlds. Bedrock is based on The Flintstones, the classic 1960s cartoon. Dynamite Gulch features your favorite animated characters, including Road Runner and Wile E. Coyote in a cartoon version of a Southwest American desert. Cartoon Junction is where you’ll find all your favorite cartoon characters under one roof. Hang out with Scooby Doo, Bugs Bunny, Batman, Superman and many others here. Gotham City, of course, is home to our favorite masked crusader - Batman. Top off your visit with Metropolis - the futuristic city that’s home to Superman. Have a fun-filled day at the famed Yas Waterworld outside Abu Dhabi and enjoy the thrill of 43 rides and slides. Spread over 15 hectares, Yas Waterworld offers everyone a welcome respite from the desert heat. Experience never-ending twists, turns, drops and rapids at Falcon’s Falaj, the 6-person water coaster or visit the Bandit Bomber, the Middle East’s longest suspended roller coaster. Experience a bumpy obstacle-filled ride as you zip through Slither Surprise, or spin around in a LED-lit bowl before your exhilarating splash into the pool below at the Serpent Spin. With something for everyone, your little ones will not be left behind! Slides, water shooters, water cannons, water geysers, and many more interactive features make Marah Fortress the dream playground for any child and has everything to keep your tot entertained. You’ve had a long day, and now it’s time to relax. Have a quick bite at Dana’s Diner where the menu is Grills and Snacks, or have your heart’s fill at Chubby’s Kitchen, a multi-cuisine restaurant. If you're in the mood to shop, head to the Sultan & Sons store or to the Qaryat Al Jelena Souk, the bazaar with something for everyone. Entry to Warner Bros. World Abu Dhabi. The park is open to visitors on all days of the week between 10.00 AM and 9.00 PM. Please note that both parks need to be visited on the same day with these tickets unless you choose the 2 days 2 parks option at the time of booking. Warner Bros. World Abu Dhabi and Yas Waterworld are located on Yas Island. There are safety and usability restrictions on some of the rides, which are based on height, in line with standard practice in theme parks internationally. While guests under 1.1 m, mostly children, will be able to enjoy rides at Warner Bros. World™ Abu Dhabi, there are a few rides that will be restricted to them, hence the above and below 1.1m ticket pricing. 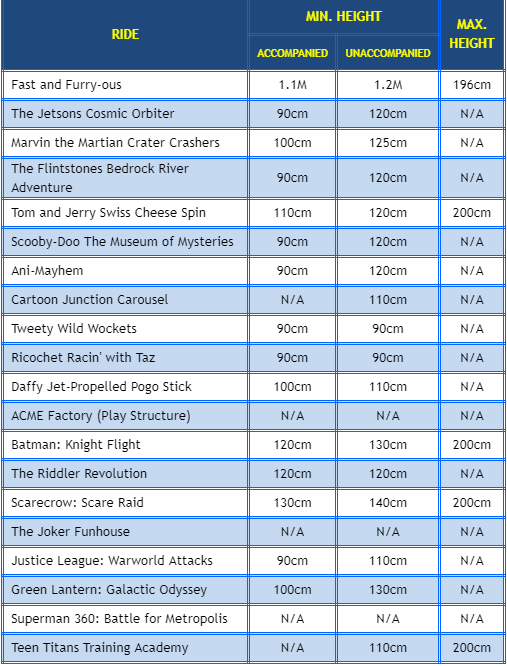 You can find the detailed list of rides and height restrictions here. Children 3 years of age and younger are admitted free of charge accompanied by their parents. Parents may be asked to provide ID to verify age of guests 3 and younger. Free shuttle bus transfers are available to and from Mall of the Emirates, Dubai Mall, and Deira City Center. There are 33 seats on the bus, which will be going directly to the park without additional pick up points. Dubai has tons of great theme parks but these two according to are the topmost ones. The Yas Waterworld has some of the most amazing water rides that I have been on. My personal recommendation--Bandit Bomer at the Waterworld and Metropolis at the Warner Bros World. You will receive an email with your Warner Bros. World + Yas Waterworld tickets shortly. You may display the ticket on your mobile device at the venue to get direct entry.